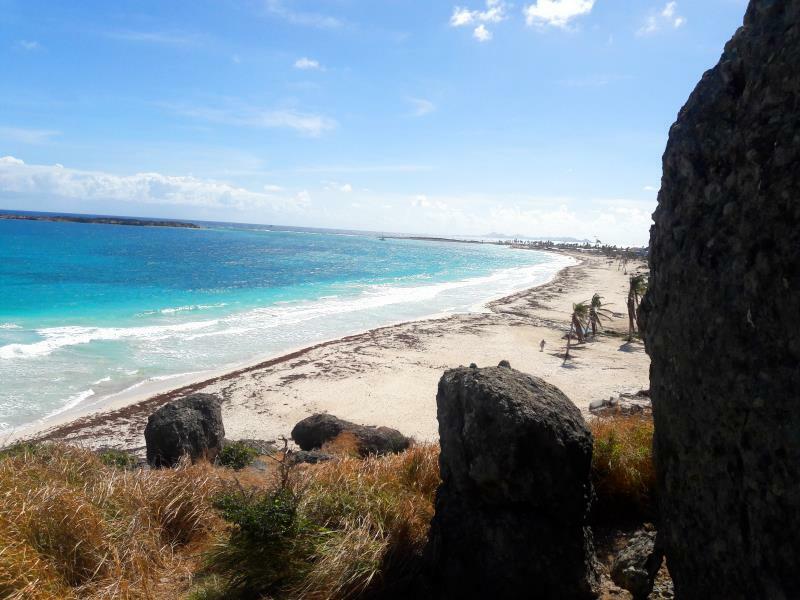 We were at St. Maarten in January of 2018. It was out third visit to the island. Previous two was with cruise trips. 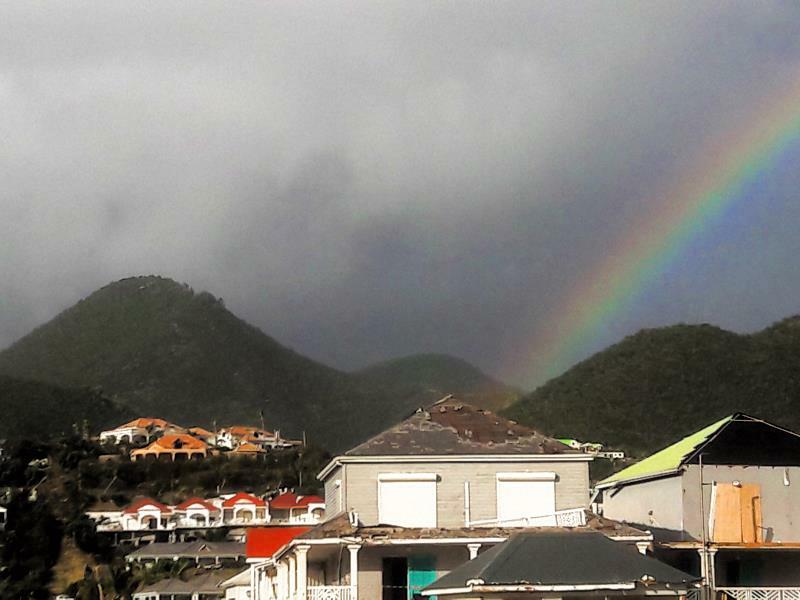 This time it was just after hurricane and for two weeks. 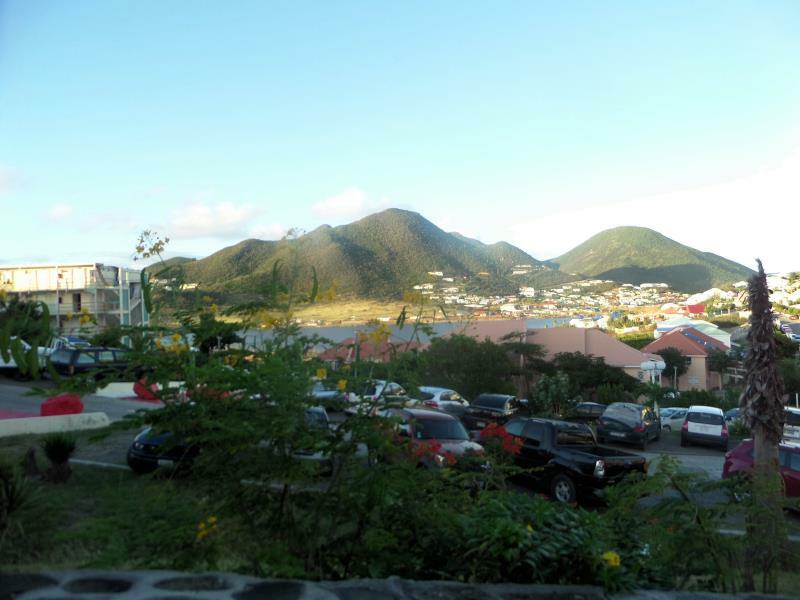 We rented studio at Mont Vernon near Orient Beach and explore what Saint Maarten can offer. 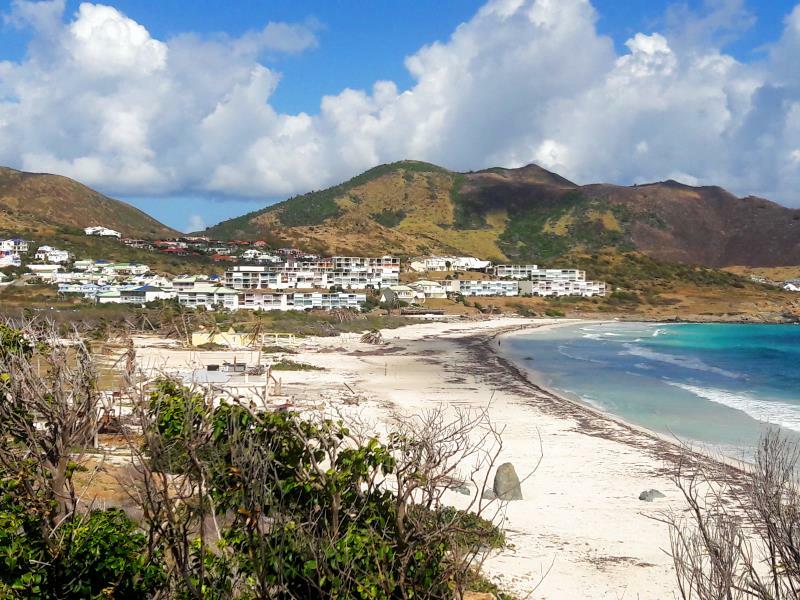 Orient beach as seen from Mont Vernon. North part of Orient Beach. 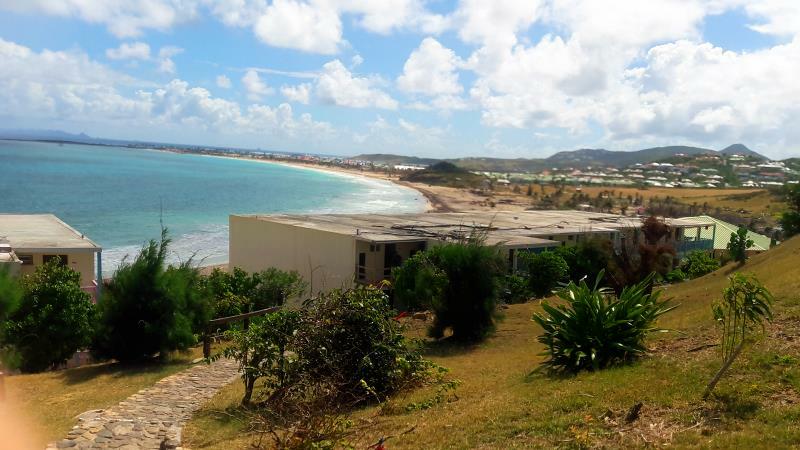 Mont Vernon behind Orient Beach at Saint Maarten. 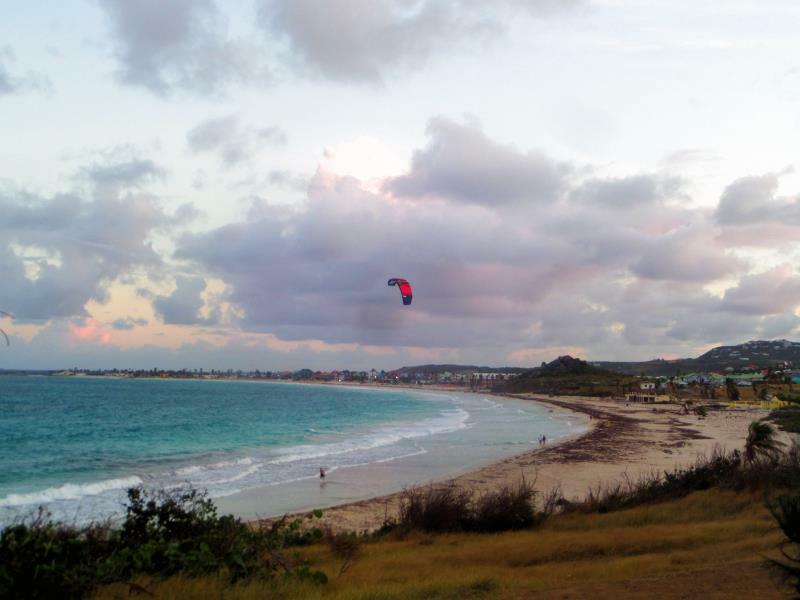 Para surfing is common activity at Orient Beach of Saint Maarten. 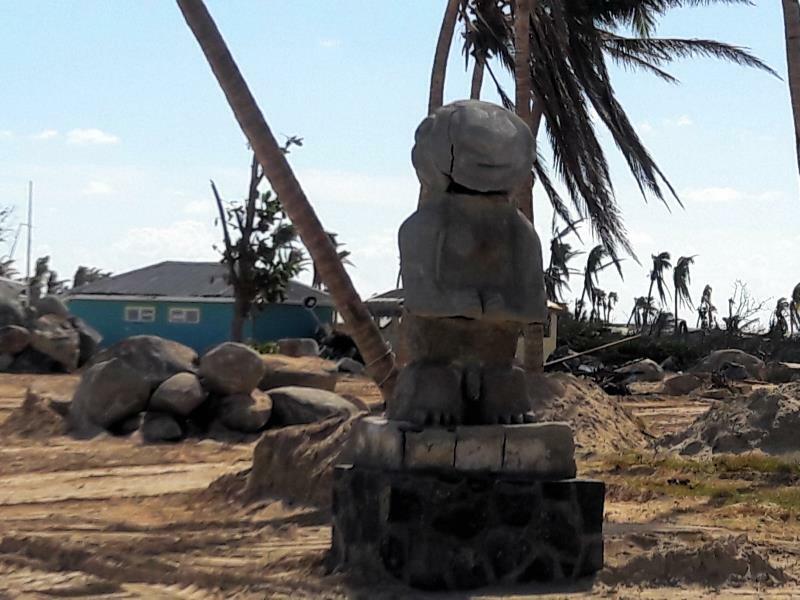 There is idol at Orient Beach in Saint Maarten. It was damaged in last storm but still standing observing and protecting French Corner. The view from Mont Vernon Hotel. 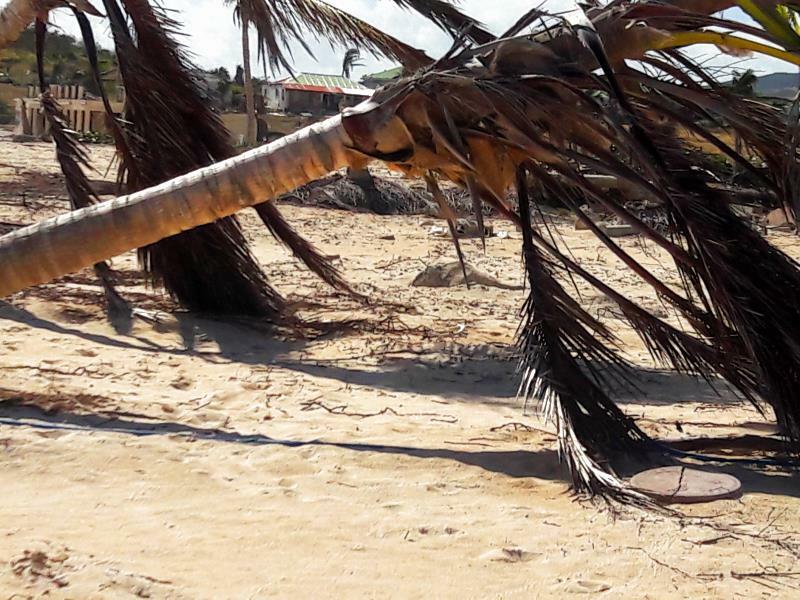 Palm toppled at Orient Beach after last hurricane. Not all palms were. Underwater picture at Orient Beach.. 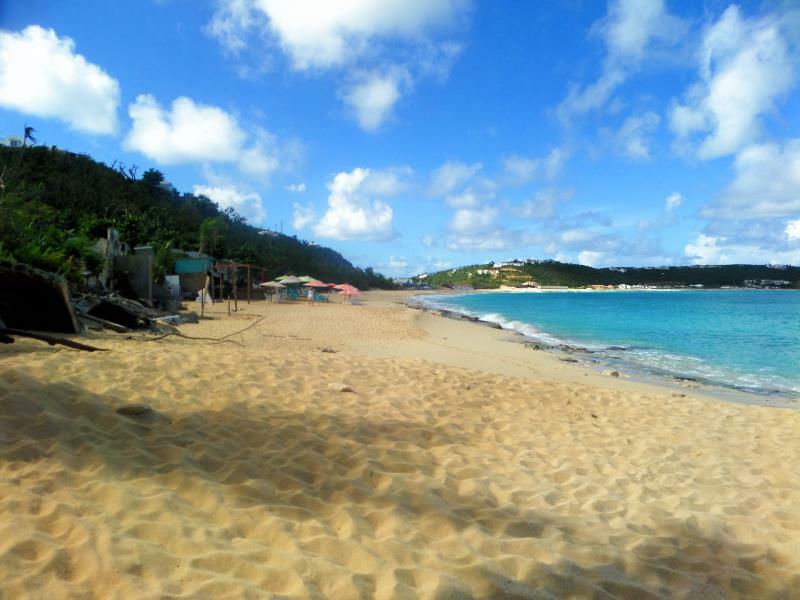 The Orient Beach in Saint Maarten located in lagoon like area protected by shallow waters from ocean waves. 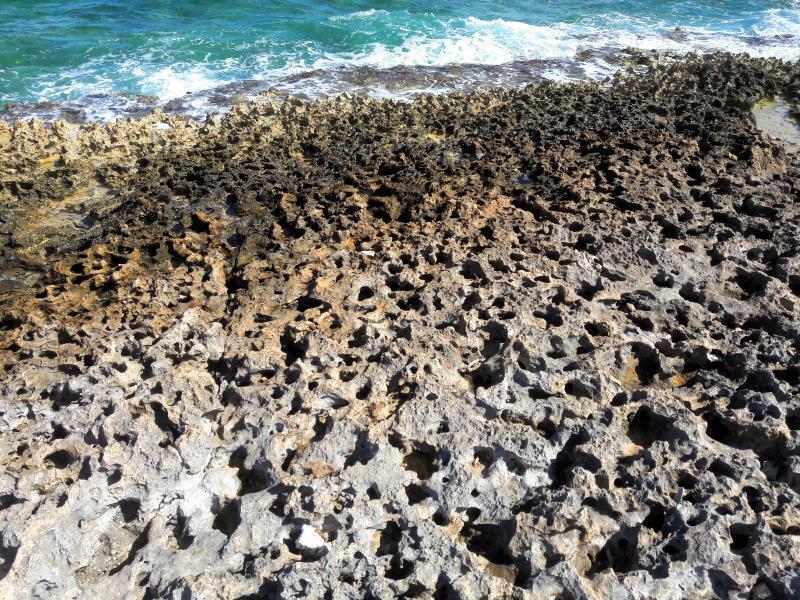 At south point is the horn open to force of nature. 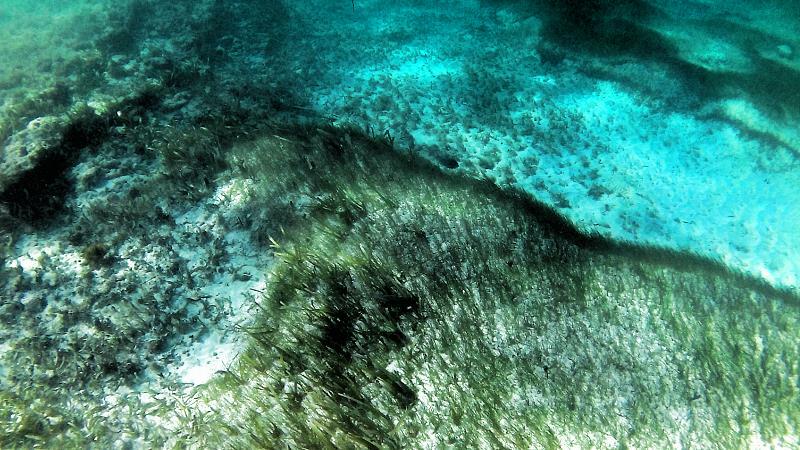 Only dead sharp corals are there. 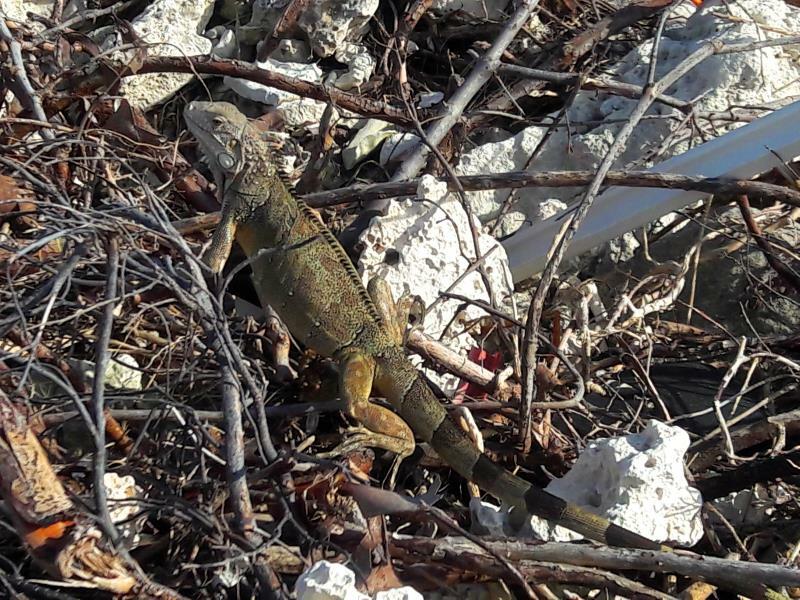 Iguana lives at Orient Beach. 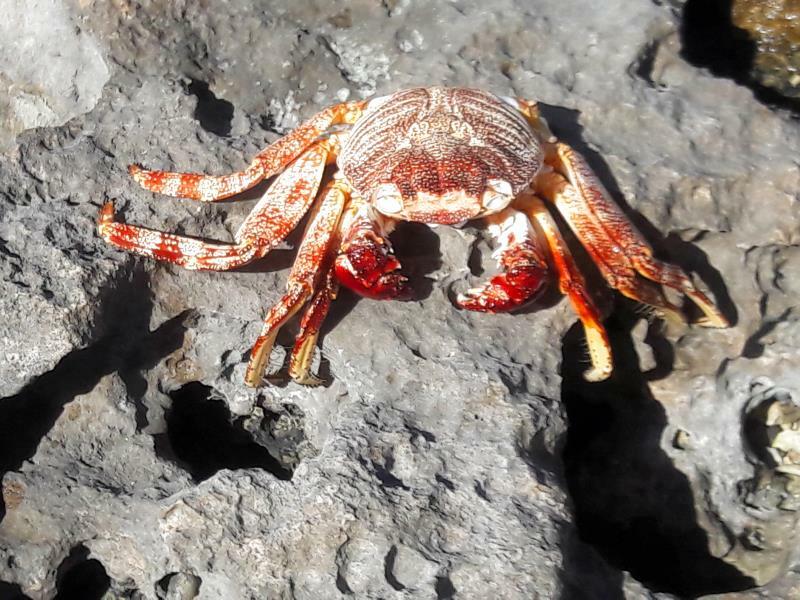 Crab shell at Orient Beach looks like real thing. 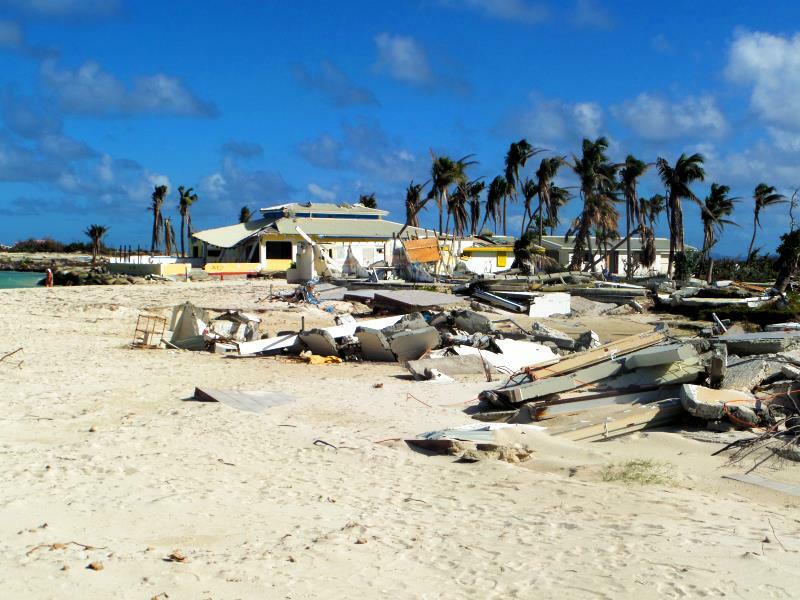 The Orient Club is in ruins after hurricane Irma. 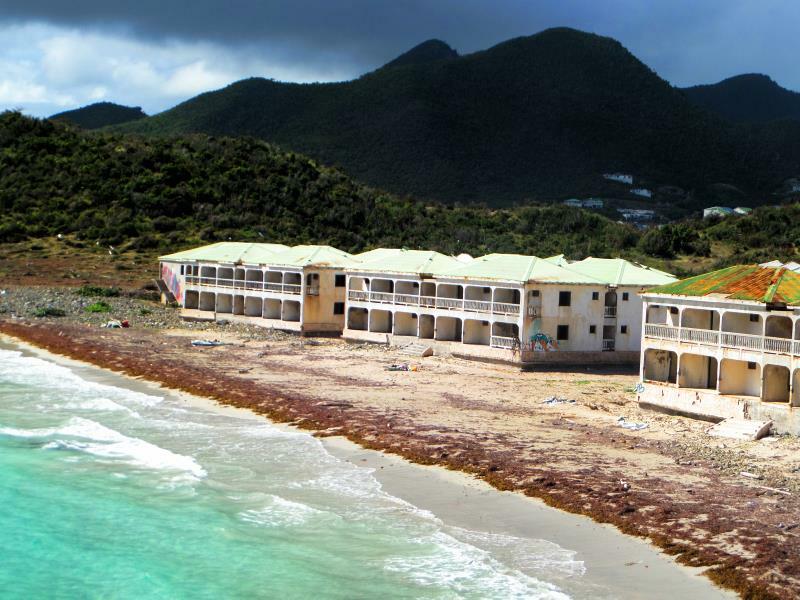 To the north of Orient Beach there is hotel abandoned complex. Was it because Irma or financial problems. It was empty at winter 2018. 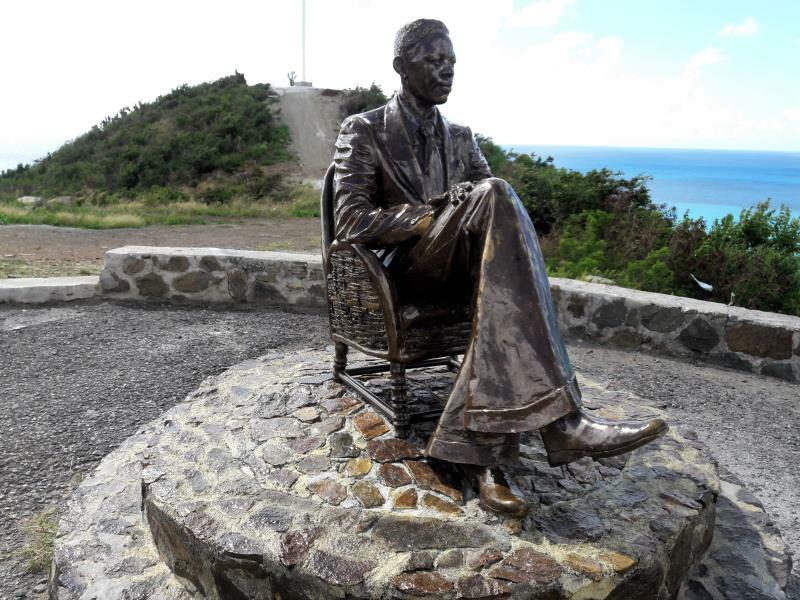 A observation point there is statue to somebody. No idea to whom. A scenic view at Simpsom Bay area. 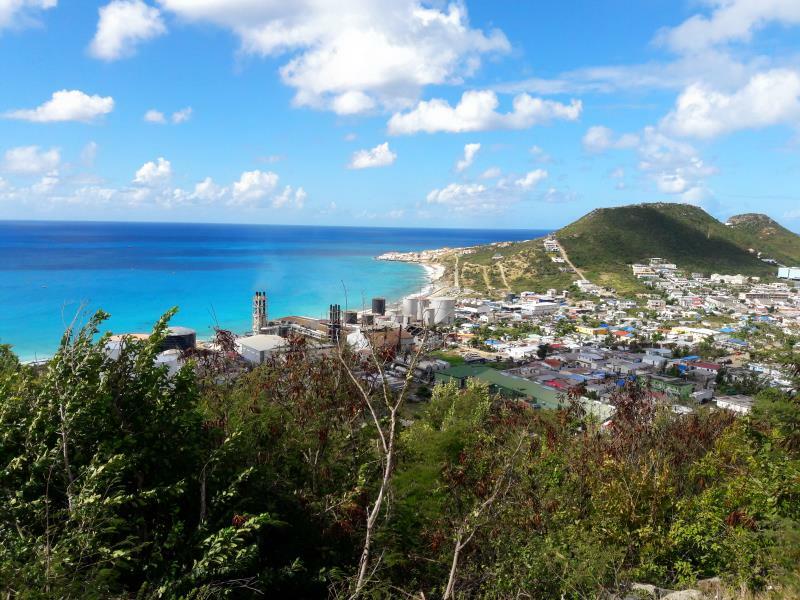 The main area of Philipsburg in St. Maarten is the seafront with pedestrian walkaway, beach and numerous cafes, other eateries and all kind of drinkeries. 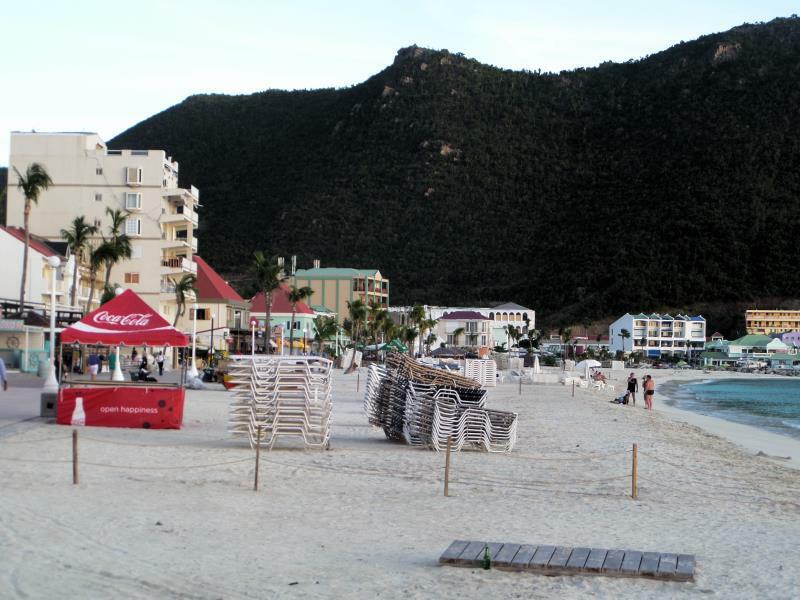 Beach and promenade of Philipsburg, St. Maarten. 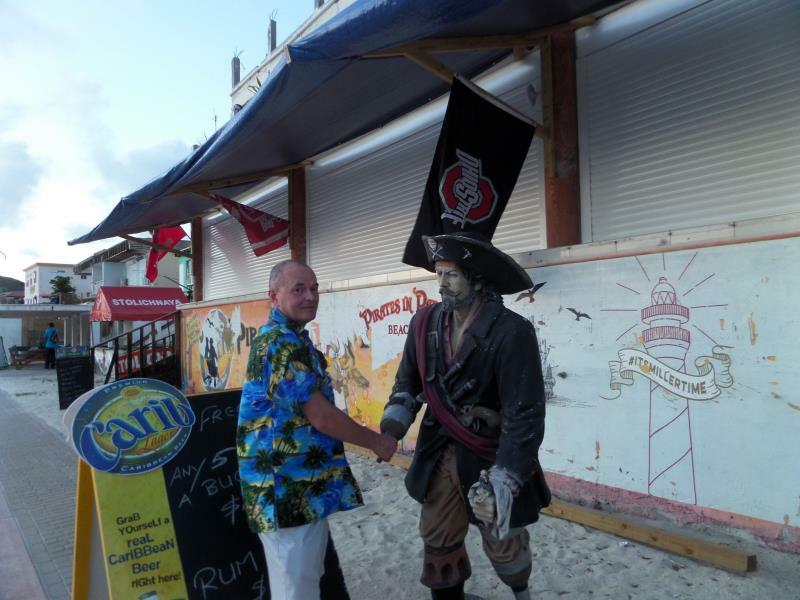 It is too much temptation to pass the pirate at Philipsburg seafront without shaking his hook in amusement greeting. At least for me it is. 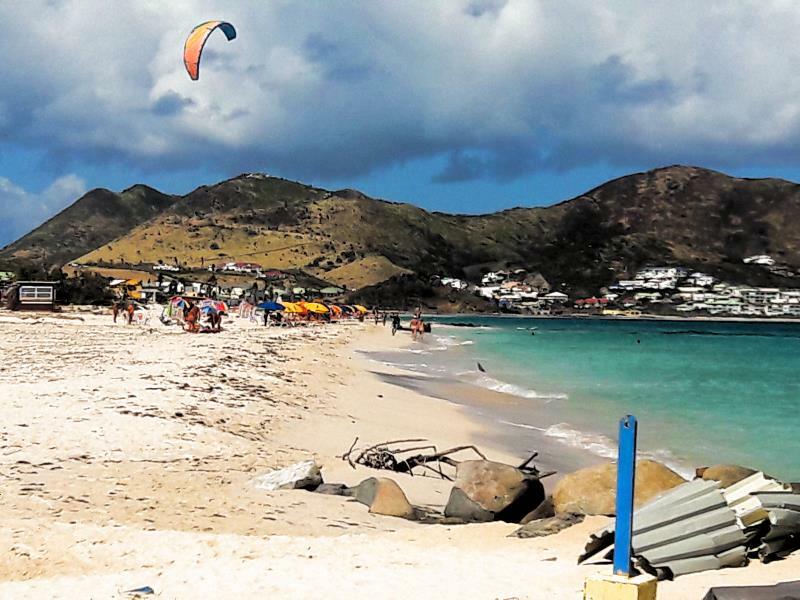 Town beach of Philipsburg is fine enough. 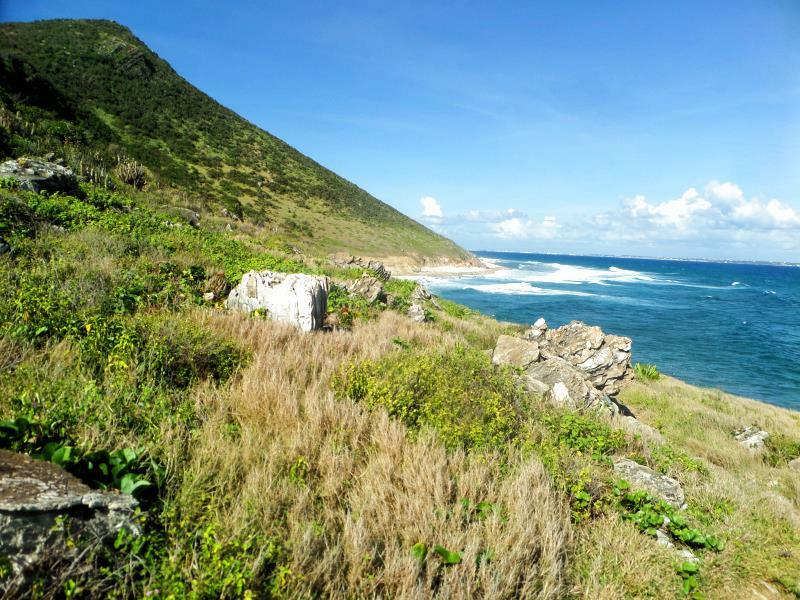 The only its cons is that these are more than few pristine beaches at St. Maarten to explore. But if you don’t want to bother riding half an hour or more to find wonder of nature this beach is OK too. 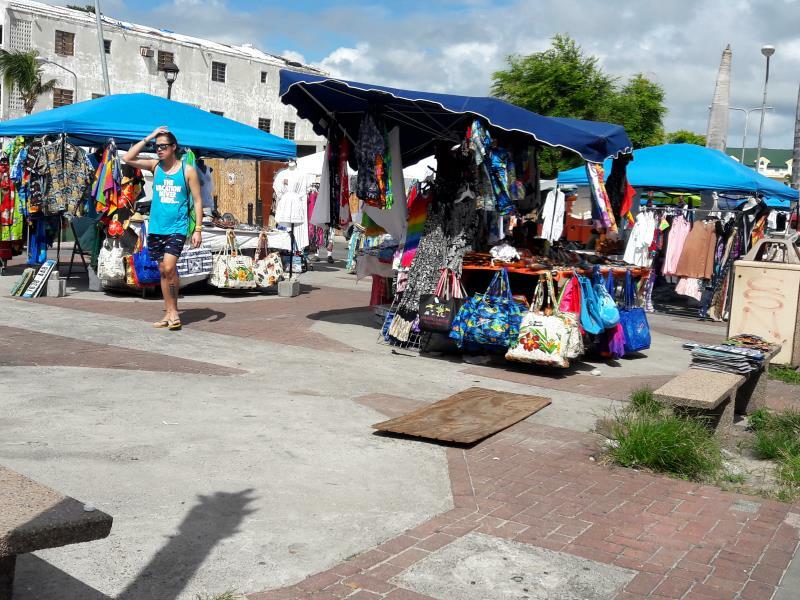 Marketplace of Philipsburg is typical relatively cheap thrift market. Will you visit or not change nothing in big scheme of life. 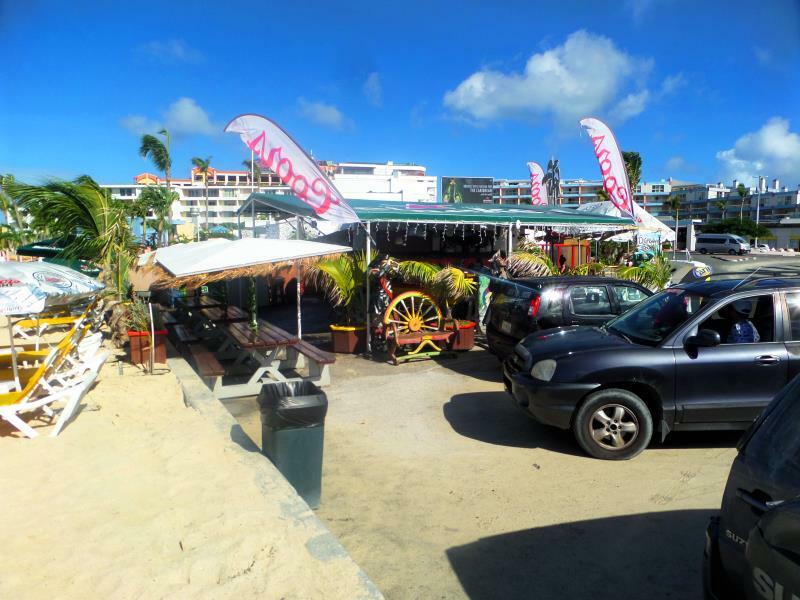 Cafe at famous Maho beach that located at the front of airport runway. Famous Maho beach at the front of Princess Juliana International Airport runway. 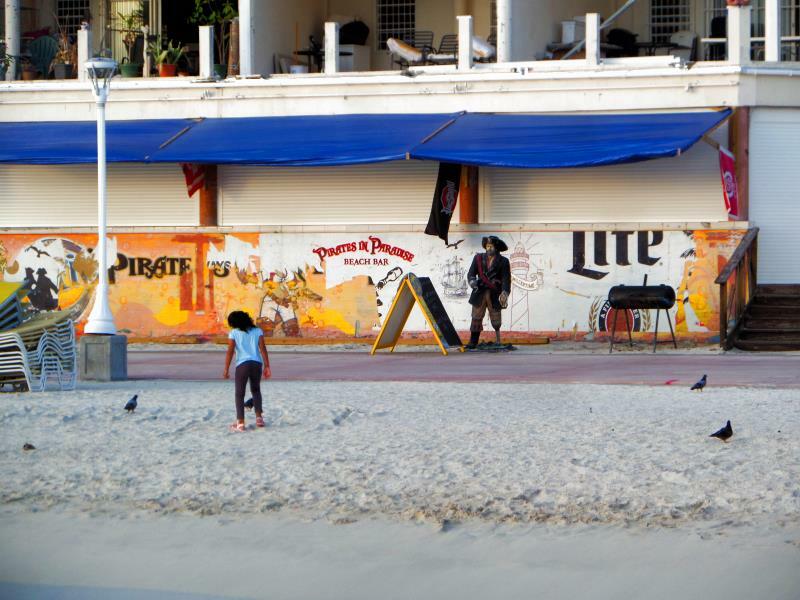 Famous Maho beach was almost empty that day. Except. 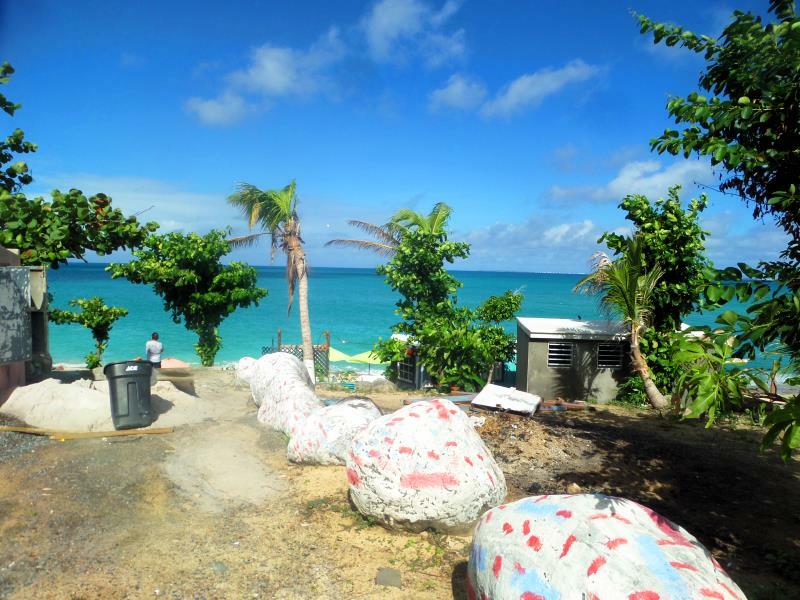 Public entrance to Bale Rouge beach at St. Maarten. 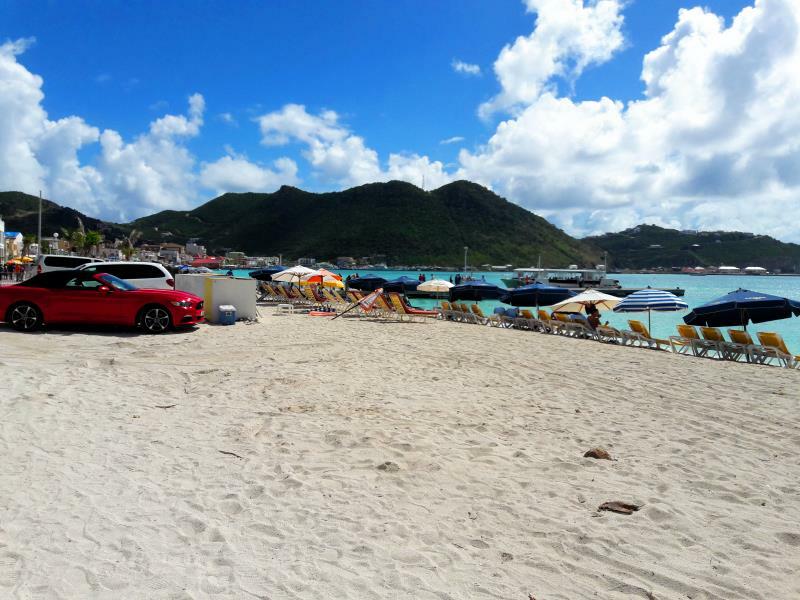 Bale Rouge beach at St. Maarten is impressive but not cozy. 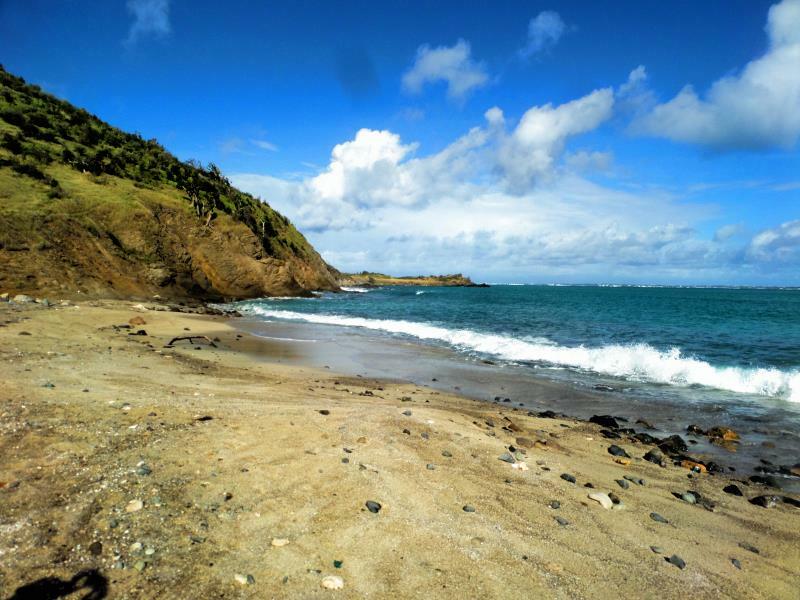 I did swim there in spite moderate waving and slightly hit leg with stone moved by wave on the way out. Nothing serious but painful and scary. If love swimming Orient Beach is the best for comfort especially when windy. 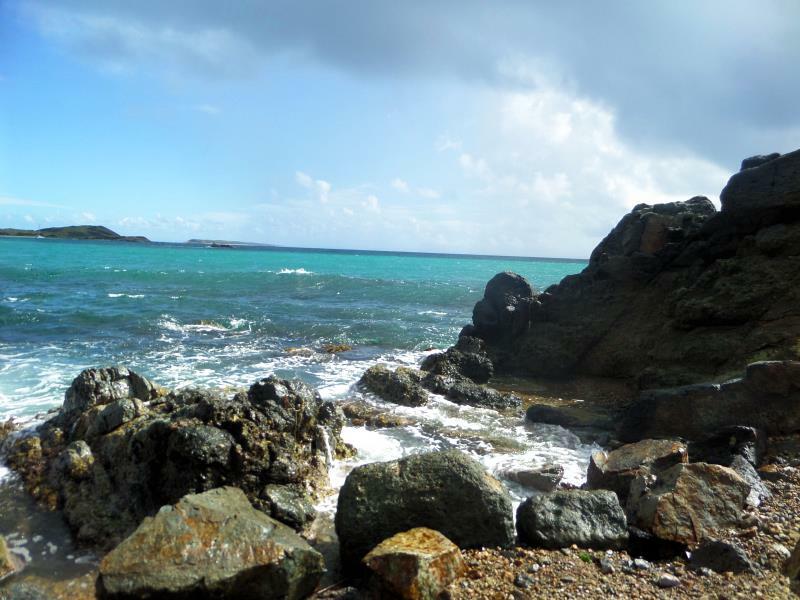 Petites Cayes is secluded beach at very north part of St. Maarten. Difficult to reach, not to comfortable but whole for you alone. 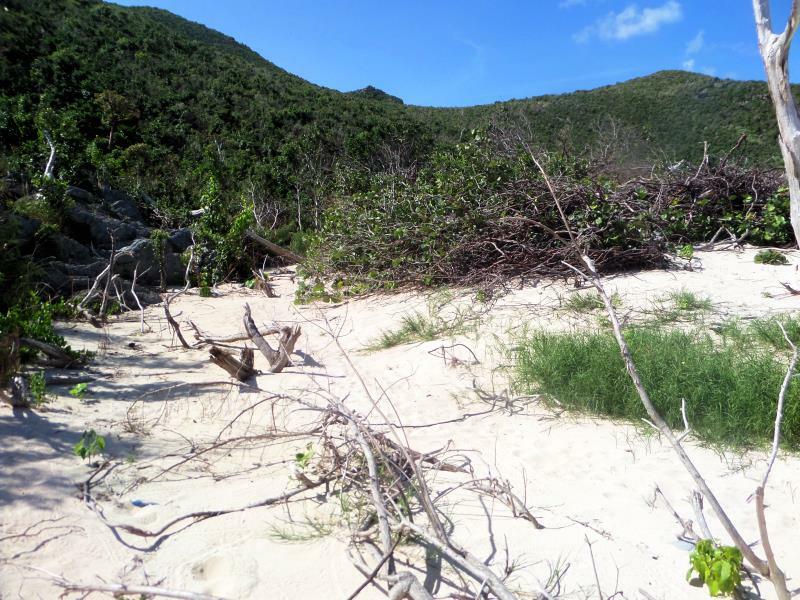 Petites Cayes is sandy area with relative dense bushes and paths inside. 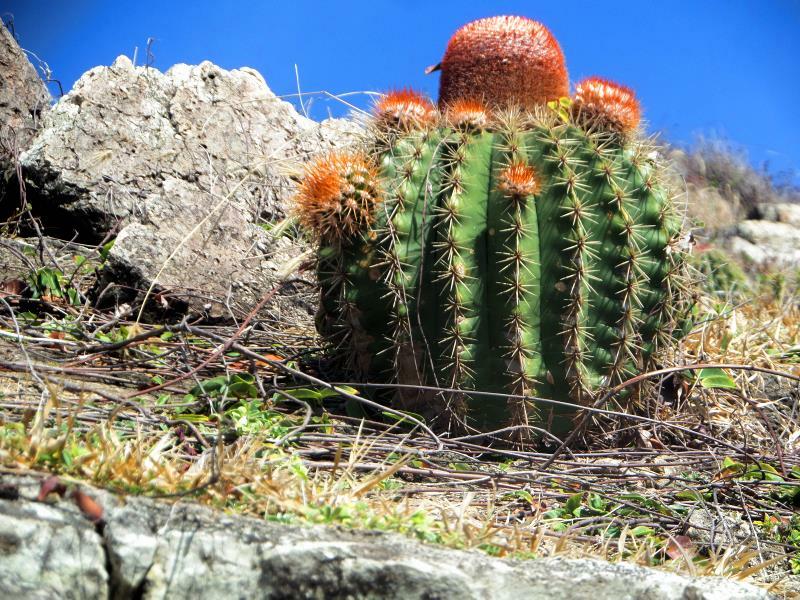 Cactus on a path to Petites Cayes. 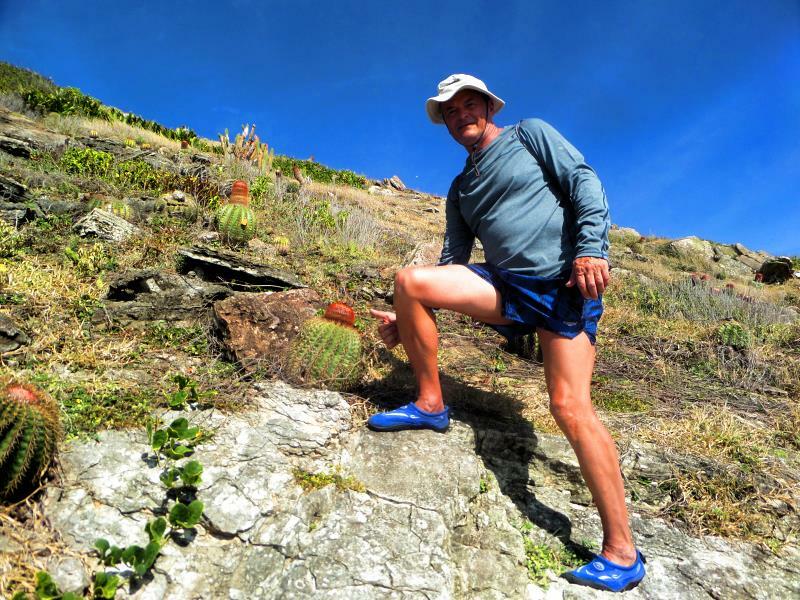 Cactuses and I on a path to Petites Cayes. 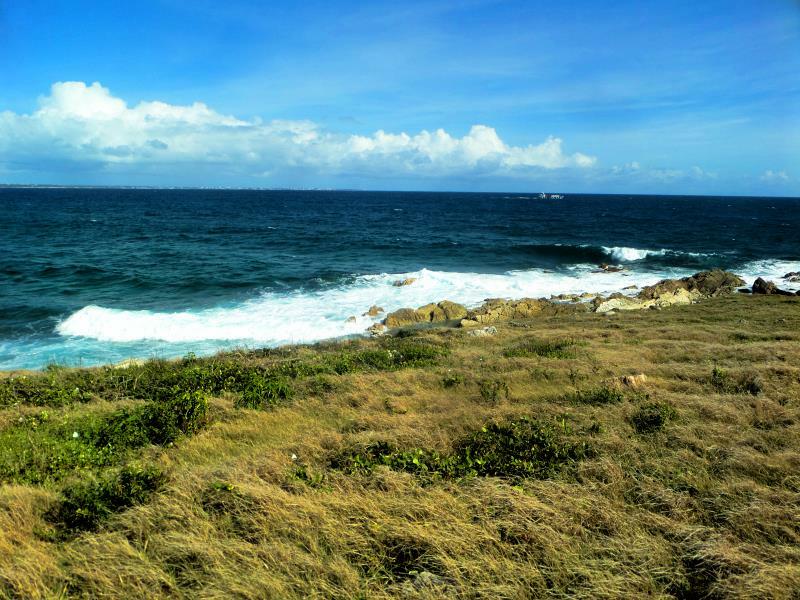 North wild shore of St. Maarten. 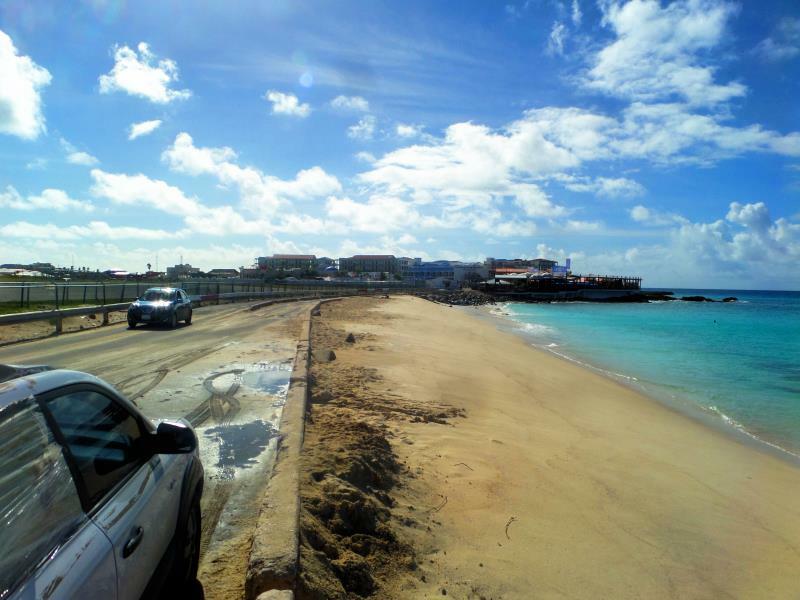 Open ocean waves relentlessly hit wild shore of St. Maarten. 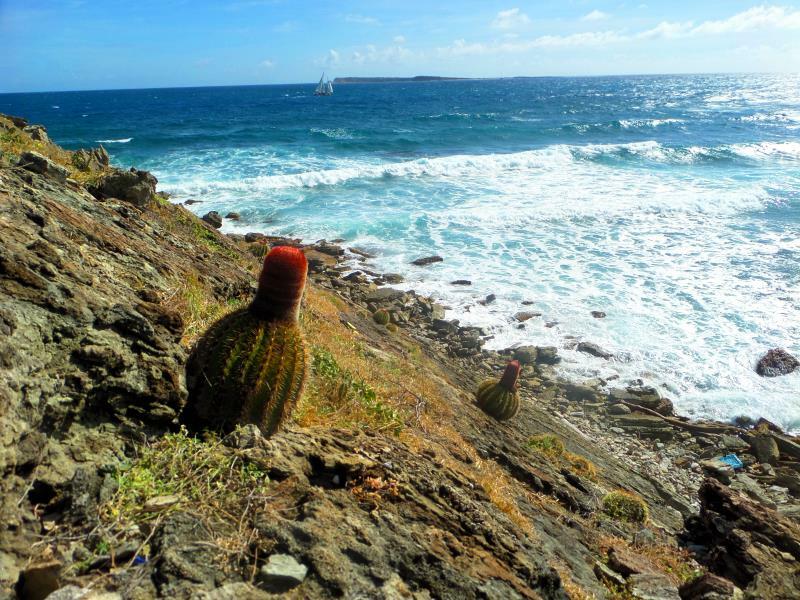 Wild cactus is fat and arrogant at St. Maarten. 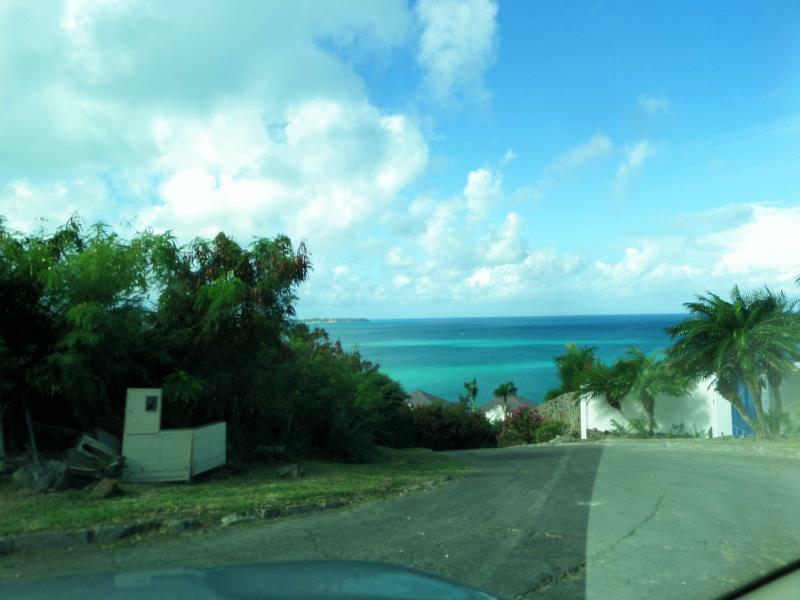 Driving in St. Maarten is emotionally rewarding with instant appearance of the blue ocean ahead. Etang Chevrise marine near the ocean and Mont Vernon is landmark. That is it about. 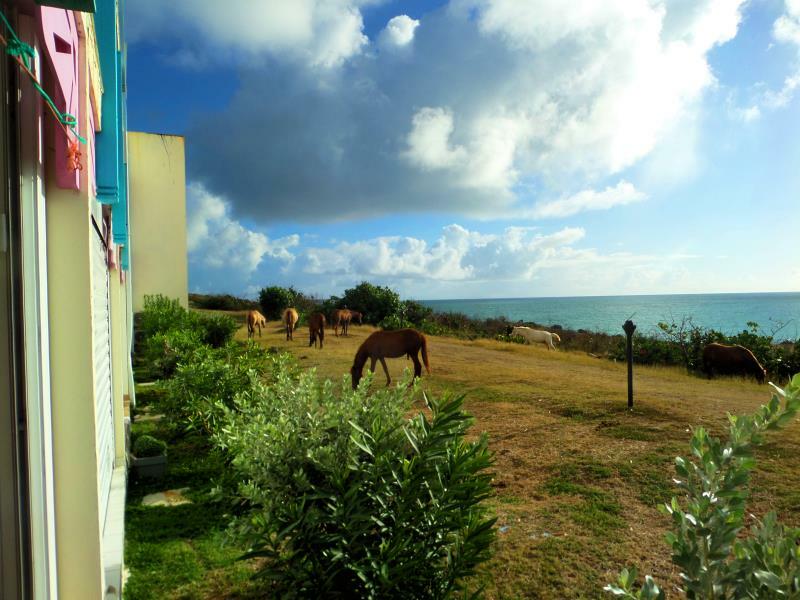 Herd of horses frequently visits Mont Vernon hotel. They pasture themselves aberrantly without being specially watched. Quite harmless if not intrusively pictured at close distance. One time the mare moved directly on me hinting that privacy not only for people when I did movie too close for its comfort. It was rather scary. Scolopendra or more precise what left of it. 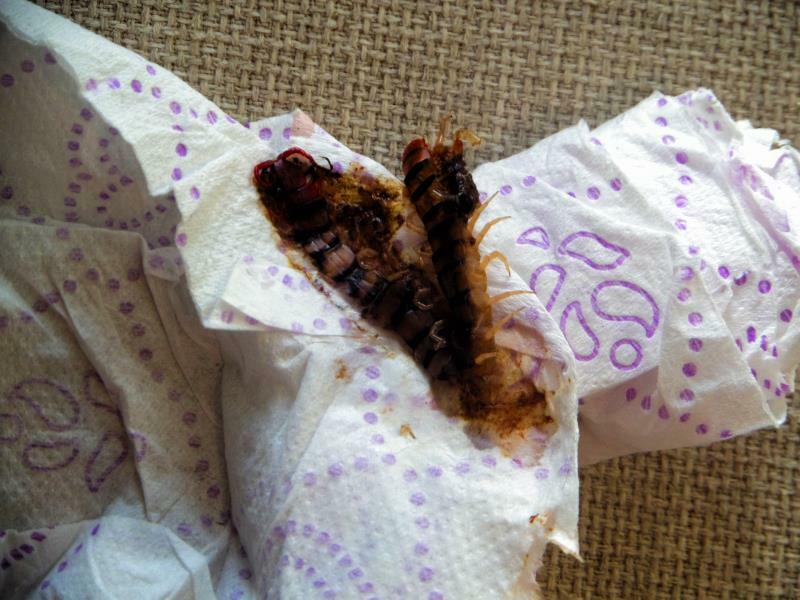 It visited out bed and bit my wife. The night was nightmare. Scolopendras at Mont Vernon are here and there not everywhere. But it is better to know that bite is very painful although fatal for humans. Use special chemicals to protect apartment spraying at left especially entrances. 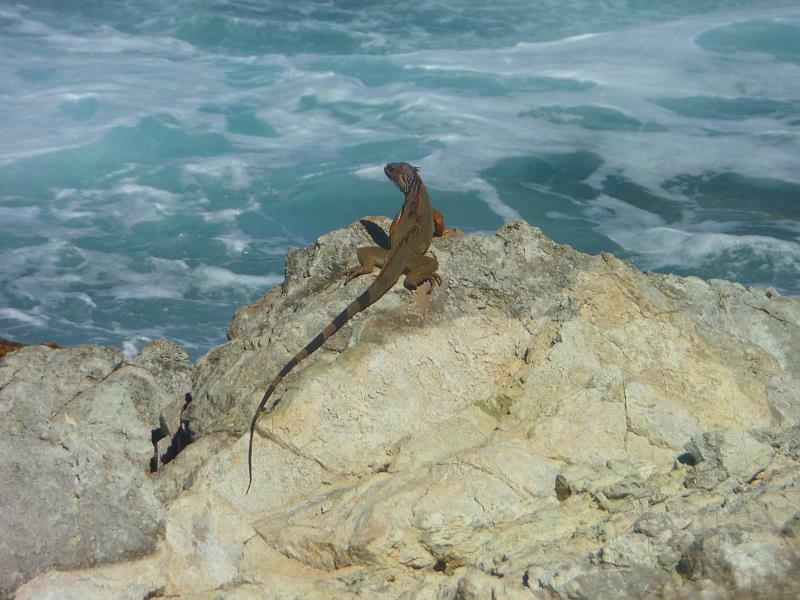 Giant iguana at the rock observing the Ocean. It is me, Leonid Sakharov. 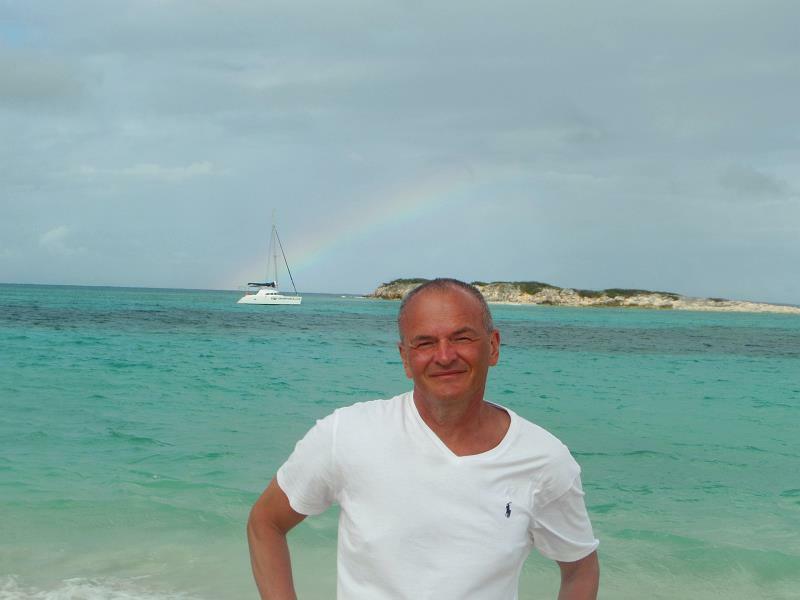 It was the top of vacation time, rainbow behind me at Orient Beach at Caribbian.